Re-posted from Nuclear Monitor with permission of the author- Richard Harkinson, London Mining Network, 11 June 2018. 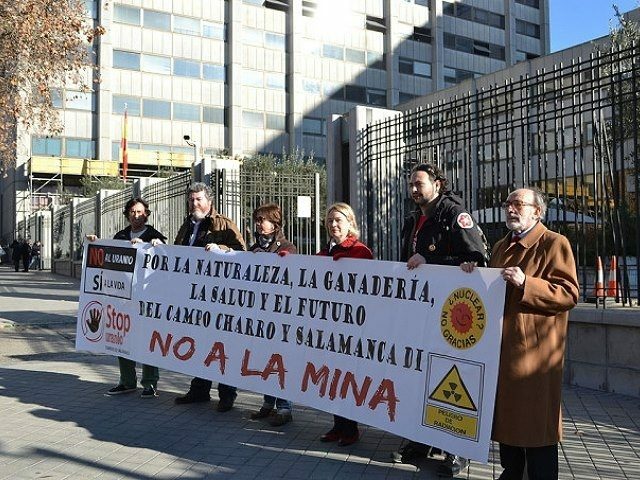 Retortillo is planned as an open-cast uranium mine, heap leaching and processing or ‘milling’ plant, said to be ready to begin production in late 2018 but lacking necessary permits and facing four public interest litigation suits from the municipality and from national non-governmental organisations. The project has sparked a wave of opposition arising from concerns about potential impacts on the environment and local people. These risks include its location very near a school area, possible impacts on a protected ecological zone, and its permit to discharge waste-water ve kilometres upstream of established drinking water extraction sites for Villavieja de Yeltes. The water discharge permit contradicts a European Commission- funded regional five-river biodiversity project because it has transboundary significance. (2,3) Close to 40 municipalities are opposed to the company’s plan to develop the Retortillo project, which has potential impacts on the existing economy including spa tourism facilities. Berkeley has renamed itself, changed some of its personnel, reduced its website information, changed its AIM nominated adviser (the AIM is a sub-market of the London Stock Exchange), and negotiated a potential ‘take-off’ contract with a commodity trader, which has ‘phoenixed’ itself; that is, one small company was liquidated and replaced by another (InterAlloys to Curzon Resources) run by the same individual. This has allowed Berkeley to raise capital, because it has obtained the support of Euratom to develop the European Union’s only open-cast uranium mine. Berkeley Energia claims on its website to have developed ‘a good neighbour and business partner relationship with the local community’ and to have local and regional support and major community investment and environmental rehabilitation plans for the project area. The website makes no mention of community opposition, health risks from uranium or other potentially negative social or environmental impacts, apart from initial felling of trees. Berkeley’s 2017 Annual Report cites ‘highly supportive’ local municipalities and sizeable community investments to date, and commits Berkeley to improve the ecological and agricultural value of the area through a reforestation programme. There is no mention of environmental risks from, or public concerns about, uranium. The Annual Report notes in passing that ‘various appeals’ against the necessary licences have been unsuccessful. It is quoted on Mining.com as emphasizing the mine’s job creation potential, adherence to ‘the highest EU environmental and safety standards’ and ‘overwhelming support’ from local and regional communities. In 2016, Berkeley published a ‘definitive feasibility study’ on its website. As the International Atomic Energy Agency (IAEA) has stated, however, the best approach advised by the UN is to evaluate the full, clearly disaggregated costs of ‘economic and social viability’. (13) Berkeley has not done this. Berkeley Energia announced on May 2 its intention to delist from AIM and instead list on the full London Stock Exchange (14) and that it intends to seek investment only from institutions. It also said it plans to list on the Spanish Stock Exchange or bolsa. In the UK, NGO London Mining Network wrote to the London Stock Exchange, a private company and regulator the Financial Conduct Authority, arguing that the listing should be frozen because of Berkeley’s wrongful claims of strong community support and that challenges to its regional permits have failed. (15) In Spain, the Stop Uranio campaign protested to the bolsa and financial regulator, which avoided decision-making in deference to the London Stock Exchange. The UK agencies declined to respond, and decided to accord full listing to Berkeley. In Spain a corruption crisis has engulfed the ruling Partida Popular (16) and the expected political upheaval is taking place with a new left coalition coming to power. The upheaval has contributed to the bolsa delaying Berkeley’s listing (17), ostensibly on the basis of the incompleteness of its prospectus. Existing parliamentary moves (18) to freeze the Retortillo project by congress committee members in Unidos- Podemos, now the main coalition partner in the new PSOE government led by President Pedro Sánchez, may well have changed the mine’s prospects. Also, the Ombudsman has declared that Berkeley failed to give information about its water discharge permit (19), and again coalition partner Unidos-Podemos is seeking to block the permit, demanding transparency. June in Spain will be a busy month! Berkeley hopes to attract German and Polish institutional investors, and the UK exchange’s lack of insistence on rigorous risk assessments may mean that the project’s risks are hidden. The UK has inadequately implemented the post financial crash 2013 Directive 34/EU on company reporting, so most mining companies like Berkeley avoid necessary non- financial reporting. The prospects for the project depend on political (20) and legal developments in Spain. Note: This article was originally written for London Mining Network’s forthcoming report “AIM-traded mining companies and human rights”, lead author Miles Litvinoff. 4. The relationship between the Parliament, Commission and Euratom is constitutionally uncertain. 6. European Commission DG Energy, Southern and western Spain – former uranium installations and national monitoring, technical report, https://ec.europa.eu/energy/sites/ener/ les/documents/tech_report_spain_2012_en.pdf, 4.4.1.3, 4.4.1.5, 4.4.3 et al. 8. Universal Declaration of Human Rights, 1948, www.un.org/en/universal-declaration-human-rights/, Art. 25; International Covenant on Economic, Social and Cultural Rights, 1966, www.ohchr.org/EN/ProfessionalInterest/Pages/CESCR.aspx, Art. 12. 9. Universal Declaration of Human Rights, 1948, www.un.org/en/universal-declaration-human-rights/, Art. 25; International Covenant on Economic, Social and Cultural Rights, 1966, www.ohchr.org/EN/ProfessionalInterest/Pages/CESCR.aspx, Art. 11. 13. IAEA, In Situ Leach Uranium Mining: An Overview of Operations, 2016, www-pub.iaea.org/MTCD/Publications/PDF/P1741_web.pdf; United Nations Economic Commission for Europe, United Nations Framework Classi cation for Fossil Energy and Mineral Reserves and Resources, 2009, www.unece.org/energy/se/unfc_2009.html. IAEA stipulates stating separately and internalised: direct costs of mining, transporting and processing the uranium ore; costs of associated environmental and waste management during and after mining; costs of maintaining non-operating production units; in the case of ongoing projects, non-amortized capital costs; capital cost of providing new production units, including the cost of nancing; indirect management costs , taxes and royalties; future exploration and development costs wherever required for further ore delineation to the stage where it is ready to be mined.